How badly do you want to grow? This is an old Greek fable about a scholar who went to Socrates. He travelled the length of the world and learned about all the wisdom available, his name was Cicero and he went to Socrates in an attempt to learn what no one else could teach him. Once Socrates found this out, he refused to teach Cicero. He begged, pleaded and finally managed to convince Socrates to at least hear his plea. Walking by the seashore, Cicero was trying to convince Socrates to be his mentor when suddenly the wise Socrates walked chest-deep into the sea. Cicero walked behind him and stopped. Socrates looked into his eyes and asked Cicero, ‘what do you want?’ To this Cicero replied, ‘I want your wisdom and I want to learn’. Socrates smiled, pushed Cicero inside water and forcefully kept him there for a while. Once he came out of water and had almost lost his breath, Socrates asked again, ‘what do you want?’ Cicero realized it was a test of some kind and loudly replied, ‘I want your wisdom and I want to learn’ only louder this time. On hearing this, Socrates pushed him into water again and let him stay there longer. Once Cicero came out of water, he was panting heavily and had almost drowned; Socrates asked again, ‘What do you want?’ Cicero knew that it was a test of some kind and replied in even louder voice, ‘I want your wisdom and I want to learn’. Socrates smiled again and pushed Cicero back into the water. This time Socrates pushed him hard until Cicero fought his way out, panting and pale, unable to understand Socrates’ behaviour. 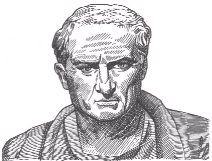 Socrates asked him again, ‘what do you want?’ Cicero arrogantly answered ‘I want to breathe’! Moral: It is important that you really want to learn, without that even joy is just a compulsion. When we want something badly and strive to get it with the whole of heart and mind – We do!